The purpose of the Group’s consultation and reporting system (hotline, whistleblowing system) is to quickly detect and prevent any illegal activities or unethical conduct, whether actual or suspected, using a framework that properly processes reports and consultations regarding unethical conduct and illegal activities by individuals or organizations. This hotline is operated jointly by Chiyoda, its domestic Group companies and overseas Group companies. It has an External Consultation Center with a lawyer available to everyone in the workplace and staff who specialize in women’s workplace issues. In the fiscal year 2017(ended in March 2018), the system received reports as follows. Feedback of investigation results to the employees from the appropriate department in accordance with whistleblowing procedures. You can scroll horizontally to see it. There was no violation of law in fiscal year 2017. Disciplinary against deviancy will be punished by labor regulations etc. depending on the degree. 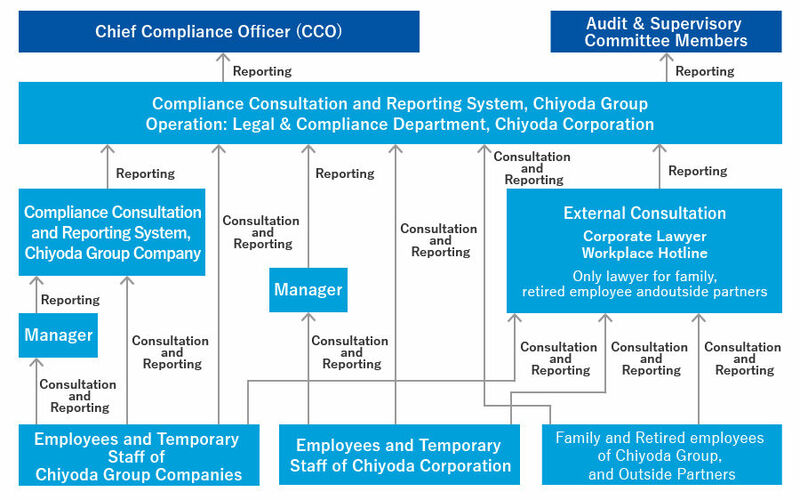 Consulting/Reporting can be done directly to Chiyoda Corporation or through three external hotlines and offices. All staff (employees, agency personnel, etc.) working for Chiyoda Corporation and Chiyoda Group Companies, their family, retired employees and members in companies having business with Chiyoda Corporation and Chiyoda Group Companies. *Consultation/reporting only available by employees (incl. temporary employees) of Chiyoda Corporation and Japanese domestic Chiyoda Group companies. *Anonymous contact is available, however Company name will be confirmed. *Consulter/reporter can choose whether the issues need to be reported to Chiyoda Corporation or not. *The reporting to Chiyoda Corporation above can be made anonymously. However Chiyoda Corporation may not be able to resolve the issue without knowing the consulter/reporter’s name. *Anonymous contact is available. However the lawyer may not be able to resolve the issue without knowing the consulter/reporter’s name. *Even if the lawyer knows the consulter/reporter’s name, the name will not be disclosed to Chiyoda Group without the consulter/reporter’s consent. *This hotline will only receive your consultation/reporting and transfer it to Chiyoda Corporation. Upon receipt of the consultation/reporting, Legal & Compliance Department will follow up and take action. *Voice mail service is available.